Today I had to go to SF to pickup my visa and my custom timbuk2 bag, and so I decided to spend the day, and check out the nation’s only $20,000 coffee maker imported from Japan at Blue Bottle Cafe (66 Mint, near Moscone Center, NOT the kiosk in Hayes Valley). I got a number and sat at the counter in front of the $20k siphon machine. The machine consists of a metal box with 5 halogen lamps with metal light dampening filters over them to keep people from being blinded by them. A small glass Florence flask is filled about half way with hot water and brought to a boil. 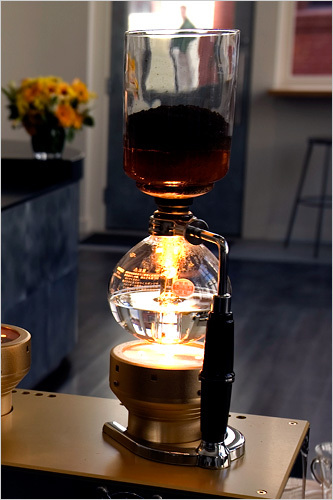 Once the boiling starts, an open cylinder with a long tube at the bottom containing a spring loaded paper filter connected a ball chain, and the ground coffee is lowered into the flask. As the chain touches the water, the water begins to rapids boil (I have no idea really why. The chain isn’t heated or anything.) The cylinder seals the top of the flask, and the water boils up through the tube and into the cylinder. The barista stirs the coffee a bit a with a bamboo paddle to ensure good mixing. As the water cools, it flows/dribbles back down the spring and chain into the flask. Once complete, the they serve you the flask (along with the stand used to hold it over the lamp), two clear coffee cups, and a cloth napkin, and two caramels. The the flask holds about four cups, so I guess it’s more like $3 a cup. So how was the coffee? The first sips, when the coffee was still very hot, you could really taste the oils in the grounds. As the drink cooled, the it developed a fuller taste. It was a very very smooth drink. Not harsh like an espresso, more like a pressed coffee, but there almost no particulates in the cup, unlike a french press. It was good. It was interesting to taste, especially how the flavor changed with the temperature, and it was interesting to watch it brewed. But as I told two women who asked me on the way out how it was, I’m not entirely sure it’s $12 worth of interesting. Still, I think you should try it, but go with a friend and split the bill. Perhaps bring two friends. The Blue Bottle, also has a “Kyoto Style Iced Coffee Machine”. (Actually, I guess they have two. No word if they were thrown in with along with the siphon bar.) The machine looks like a really tall titration setup. There’s a large sphere half filled with water and condensation at the top. The water drains down through a metal funnel into another much smaller sphere that then drains to two independent valve controlled drip spouts. Each spout has some sort of gauge on it, but I couldn’t make out what it was. Maybe it was a thermometer, I don’t know. The water then drips down into a 1.5 liter cylinder below. When I asked the barista about the machine, she said it took 8 hours to fill the cylinders. I guess you have to call ahead, because I seriously doubt they serve day old coffee, but placing an order for coffee the day before sounds absurd. What I really look for in a coffee shop isn’t the coffee, but rather the atmosphere. Of these two places, Ritual wins. Blue Bottle has a very pretentious feel, which I guess isn’t surprising given that it has a $20k imported coffee maker in it. Blue Bottle is also a small place. A very cleanly decorated place. White walls, light oak bar and tables. It just has a very clean look to it. Ritual is similar, but they have local art on the walls. The current art are cartoons from Paul Madonna, including this one. Still, neither really have quite the vibe I look for in a coffee shop. Ritual is much closer, but really, I want something with crappy furniture, and some indie art on the wall. The verdicts: Try the $20k siphon bar, to say you’ve tried it. It’s fine cup of joe, but if you have to choose one to hang out at, hang out at Ritual. This entry was posted in other, personal and tagged bluebottlecafe, clovercoffee, coffee, ritutalcoffee, sanfrancisco, siphonbar on January 28, 2008 by jonathan. I needed a new laptop back since my old one developed some tears. (I think it was caused by the D-clip I hooked on to it.) After seeing that Timbuk2 was allowing people to custom order bags, I drove up to the retail store in SF, and made one just for me. A week later, it was ready. It cost $140, just $10 over the normal price. 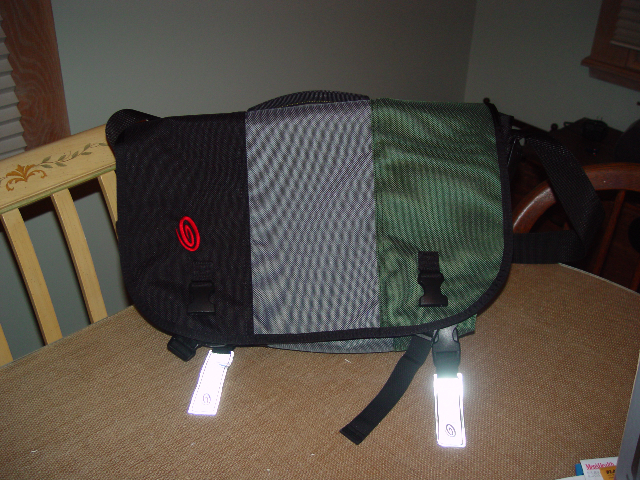 This entry was posted in other, personal and tagged clothing, sanfrancisco, timbuk2 on January 28, 2008 by jonathan.